Having baby can feel as if you’re world has been turned upside down, now there is a little person needing you for everything from needing you to feed them to singing them baby songs and keeping them entertained. However, as they grow older, you find that you want to try your best to protect them from everything that could warm them. 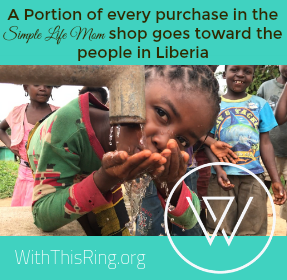 Here on Simple Life Mom, I try to give other ladies and moms tools for a completely toxin free environment: pure bath product recipes, makeup recipes, healthy drinks, essential oil use, fresh food ingredients, and other natural living ideas. Homemade baby wipes are great to have around, even if your kids are older. 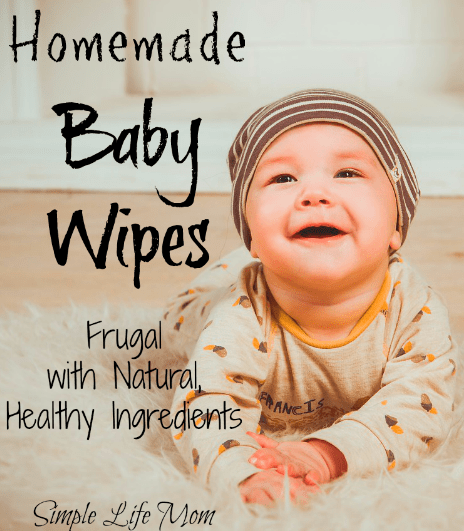 I actually use these homemade baby wipes with a different set of essential oils as disinfectant wipes (click here for disinfectant essential oils – not for babies, obviously). These wipes are very versatile, depending on your needs. As a fun Bonus to this recipe, we’re going to have another Giveaway with multiple prizes for 3 different winners. Sometimes word of mouth is the best way to find great resources for our little ones. My sister-in-law was always wonderful in this sense when my kids were little. I was sponsored to check it out and give my real opinion of whether I like it or not. 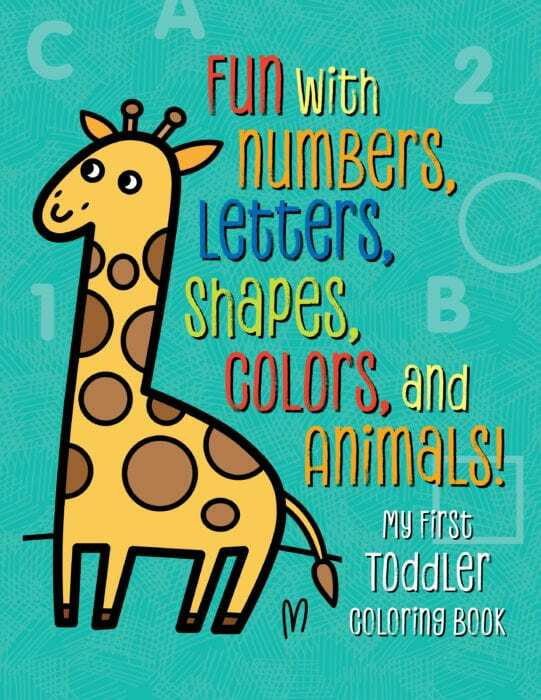 As a preschool and elementary age educator, I greatly appreciate the simplicity, size, and content of My First Toddler Coloring Book and its focus on early education. Size: Kids around 1-3 years old are just developing large motor skills, while fine motor skills are slowly in the works. Coloring helps with that, while providing nice sized coloring objects for their age. 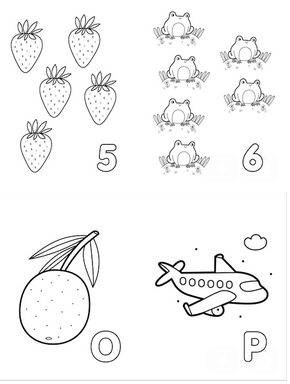 For example, they can color a number of large strawberries while naming and counting them. Content: This is the age of pointing and identifying. You can give them a new page each day, talk about it, name it, count it, and color it. You can get it now here. Use the coupon code: 2COLOR (valid 1/18-1/25) for $2 off. Now on to the recipe! There’s a reason you’ll want to switch to making your own baby wipes. The ingredients that are in normal wipes from the store is shocking. There are ingredients like Disodium EDTA, Polysorbate 20, Tetrasodium EDTA, a lot of different types of parabens, plus chemical fragrances and other unwanted ingredients. And this is something you put on new, developing skin? 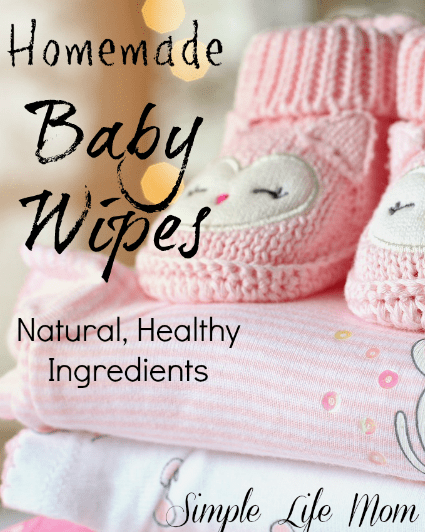 Choose healthy ingredients that will nourish your skin and your baby’s skin by making homemade baby wipes instead. I chose ingredients that would help neutralize the acidic nature of urine and bring the ph level of the skin more quickly back to normal. For that reason, I don’t use apple cider vinegar. Instead, I use aloe, and avocado oil for their healing and alkaline properties. You’ll need high quality paper towels with no added ingredients. Don’t buy anti-bacterial, moisturizers, etc. Instead, buy strong plain paper towels – or use cotton baby washcloths that can be rinsed and thrown in the wash. Carefully cut the roll in half with a large knife so that you have 2 square rolls. You can usually bend and pull out the center tube at this time. If you can’t, just leave it. It’s not a big deal. Re-purpose an old wipes container or use a plastic container with a sealing lid. Aloe and rose water are extremely calming and healing to the skin and slightly alkaline. Liquid soap is also alkaline and will help to balance the ph of the skin and allow impurities to be easily removed. Avocado oil is a great for nourishing skin and will be jut enough to gently replenish oils as the skin is cleansed. Essential oils are optional, but if you prefer lavender‘s ability to calm irritated skin and calm through aromatherapy, go ahead and add a few drops. Other essential oils that are gentle on small children are chamomile, cedarwood, and sweet orange. I don’t recommend using essential oils on infants, but for older children you can use up to a 0.5% dilution, which is up to 16 drops of gentle essential oils in 2 cups of liquid. Place all ingredients in a large bowl and whisk together rapidly. The oil will sit on top until slightly emulsified by your whisking. Once the oil is thoroughly mixed in, place one of the paper towel squares into the bowl and let it soak up all of the ingredients. Turn as needed until all of the liquid is absorbed. Cut paper towel roll in half so that you have two large squares. Remove center cardboard if you can. In a large mixing bowl, whisk together aloe liquid, rose water, liquid soap, avocado oil, and essential oil until oil no longer sits on top. Lower one half of the paper towel roll into the liquid and let it soak up the liquid. Turn if necessary. Place in a plastic sealable container until ready to use. This giveaway is for those in the continental USA, though those outside this range can enter for my Free pdf printables. It will run from today, 1/18/18 to 1/25/18. I love to make special things for my grandkids. It’s important to me to keep them as free from chemicals as possible. I am always trying to make safe and healthy things for myself and my family. I can’t wait to try these recipes for my grandson. He’s almost 2 and still isn’t talking yet.. His mommy will be getting him in to a speech therapist soon and this coloring book would be wonderful for our little learner. I love your posts! It is 1 – 2/3 cup. The font did make it small, I’ll make an edit. Another fun giveaway and a chance to win goodies from you – awesome! Thank you for having another giveaway! No, I don’t have any children, BUT husband and I have very sensitive skin. 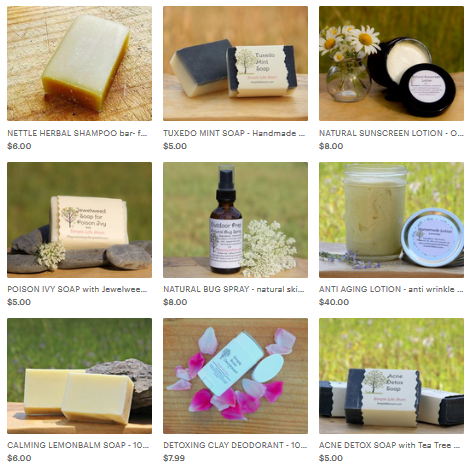 I love your all natural products – they are high quality, work well, and smell so good! PS. I didn’t know you are a teacher – me too! I was a toddler and pre-school teacher for 28 years. That’s wonderful! I taught Preschool and then elementary school before having kids, and have taught classes K-12 continuously since then. It happens when you homeschool. I teach mostly science courses now. I have small children so I am always on the lookout for healthy recipes! My friend just had a baby and was looking for all the chemical-free options, I will be sharing this with her! I have some balm of Gilead made from my cottonwood trees. I want to use that instead of the avocado oil but I’m afraid the rose water will smell odd mixed with the cottonwood scent. Do you have another suggestion to replace the rose water or should I just use more aloe? Sorry, I’m incapable of following a recipe as written and always have to change it up. It’s an affliction. You can just use more aloe, no problem. I do have a small kiddo at home and just found out that I am expecting once again! You can just make it without the essential oils.